Positive Eye has generously sponsored VIEW for many years. Positive Eye is a leading provider of educational consultancy and training for professionals working with children and young people with vision impairment. Their courses and products are widely used throughout the UK, Europe and worldwide. Positive Eye kindly offers discounts for VIEW members on some of their unique products. Taking a unique and practical approach Positive Eye offers a range of services from a full consultancy service to hands on, interactive courses which clearly demonstrate how to improve learning outcomes and measure progress. Our practical, customisable and easy to use products support your Service or school delivery and the children you work with. In addition Positive Eye runs a correspondence braille course, and collaborates with a wide range of partners including RNIB, VIEW, charities and the University of Birmingham. We also contribute to the delivery of a postgraduate diploma course for teachers of VI. Dolphin is the only specialist software house developing solutions to suit all types of reading impairment – from low vision to blindness and dyslexia. You can speak directly to the makers of our products – we design and develop our products in-house – so when you call us or meet us, you’re speaking directly with the people who know most about the products you’re using. Our design and development teams are experts in building software to suit user requirements, and our highly knowledgeable sales and support teams can help you find and use the perfect software for your needs.Dolphin SuperNova has been developed with many education specific features to benefit visually impaired students, includng the SuperNova USB for flexible studying on any Windows PC, and Connect & View for connecting to the teachers interactive whiteboard. We also offer a home and school licences policy; whereby any licence purchased by a school is matched by a home licence for the same student for continuity in their learning. 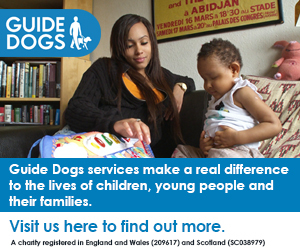 Guide Dogs are one of VIEW’s more recent sponsors, and we value their support. • Recreational activities, including Family days out. SeeAbility is now kindly sponsoring VIEW. Registered as The Royal School for the Blind, SeeAbility is one of the oldest disability charities in the UK and has pioneered specialist support for over 200 years. 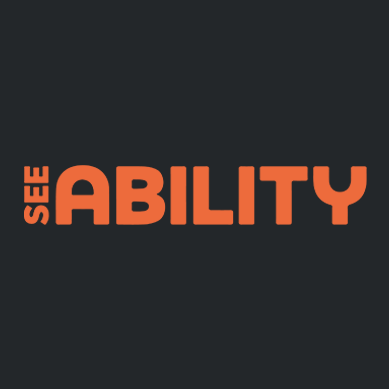 SeeAbility provides extraordinary support and champions better eye care for people with learning disabilities and autism, many of whom have sight loss. “We are currently running a programme of eye care in special schools and working with QTVI colleagues and teachers has been crucial in embedding an understanding of the results of sight tests, support with glasses and enabling children with SEND to make the most of their vision.